The Model 19L Thumbsnap Suede-Lined Leather Holster by Bianchi cushions and protects firearms while keeping them within easy reach. 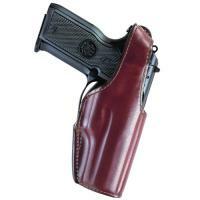 The handsome and durable full-grain leather holster is lined with suede to prevent marring of the weapon's finish. The thumb break secures most models of semiautomatics in a forward cant position with a low-leading edge, while Bianchi's Sight Channel™ shields front sights. The open-muzzle holster rides high on the hip and close to the body for comfort as well as maximum concealment. A 1.75-inch wide belt loop provides exceptional stability when worn.